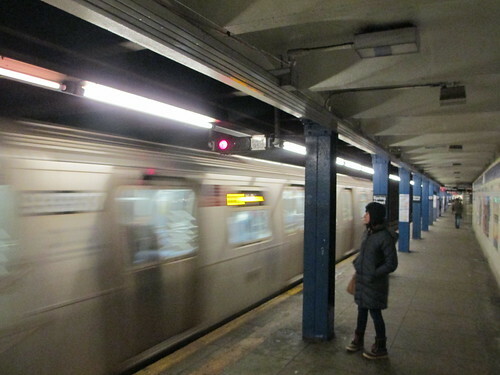 It’s not a term that many people would associate with a journey on the New York City subway. 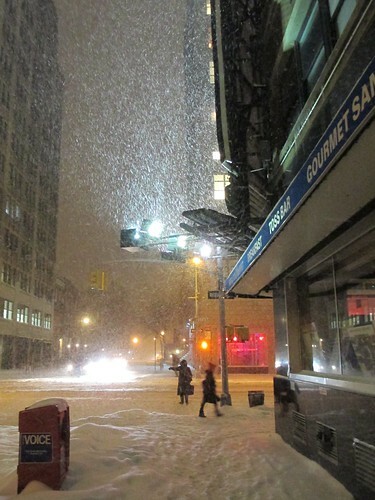 But, as I trudged up the steps on Thursday from the C Train station at Spring St, I felt a warm glow of admiration. 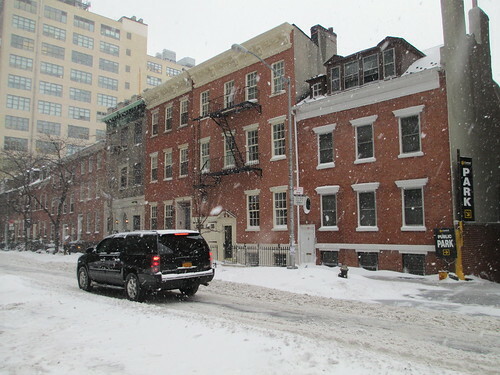 I emerged onto Vandam St to find that day’s blizzard – which would eventually drop 14 inches (36cm) of snow on parts of the city – still in nearly full flow. 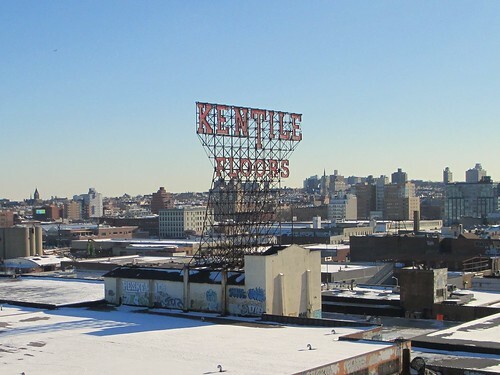 The transit system had nevertheless transported me with what seemed to be insolent ease from an above-ground station in Carroll Gardens down into the tunnels to downtown Brooklyn then, on another train, across the east river to the west side of lower Manhattan. The journey’s smoothness was a tribute to the virtues of forward planning, teamwork and operational excellence that make for a smoothly-running transit system. At street level, by contrast, a rental truck whose driver had got it stuck on a pile of snow was blocking the street, holding up a snow plough. Yet, just the day before, it occurred to me, I’d been raving about how magnificently satisfying my cycle ride to work had been. I’d braved well-below-freezing temperatures and persisting patches of ice and snow to ride to work on both Tuesday and Wednesday, enjoying the challenge of the unpredictable conditions and taking in magnificent views of the city spread out before me. Wasn’t there a contradiction, I thought to myself, about my two positions? If I enjoyed using perhaps the most individualistic of mechanised transport methods – the bicycle – wasn’t it odd I also admired such an obviously shared form of transport as the subway? Moreover, it occurred to me, why wasn’t I alone in my shared enthusiasm? Why did so many of the cyclists and cycling advocates I knew have a decided preference for subways and buses over cars in conditions when they couldn’t get about by bike? Trying to leave an F Train when the track ahead is on fire. make you smell the acrid smoke. 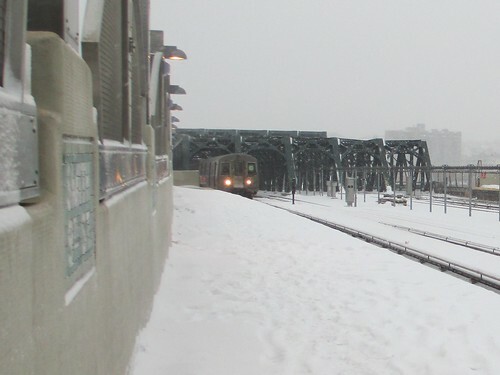 I should start answering those questions by making it clear that not all – possibly not even most – of the subway journeys I’ve been forced to take for weather reasons in recent weeks have evoked the warm feelings that my trip on Thursday did. I’ve had plenty of long waits for trains and other disruptions, including the two-hour journey home I mentioned in a previous post. Worst of all was my experience on the morning of February 3. After unwisely guessing that the F Train to West 4th St would be my quickest route to SoHo, I found myself trapped underground for 40 minutes. The live rail in the station ahead was on fire and power to our train was cut while the fire department tackled it. I don’t especially recommend the experience of standing in a confined space with emergency lighting, no air-conditioning and a growing smell of acrid smoke in the air. it took teamwork and organisation to get this train running. I should also confess that part of my feeling for subway systems stems from my background. My late father, who taught me to ride a bike, devoted his whole working life to subways – first in London, then in Glasgow. While my journey to work last Thursday might have seemed easy to me, I know that subways do anything but run themselves. My dad, I recall, diverted the taxi taking him and my mother to their 20th wedding anniversary dinner to the subway depot. A train had derailed at a critical point and he wasn’t going to relax until he was sure it was on its way to being put back. I associate the New York subway also with my grandfather, who visited New York as a seafarer in the 1920s and told us wide-eyed children decades later about the marvels of express and local trains and the other complexities of the subway system. But there are also plenty of things about transit systems that cyclists can appreciate even if they haven't got my back story, I think. While many motorists seem to view their car as an extension of private space, I recognise clearly when I’m on my bike that I’m involved in a complex social interaction. The difficulty of communicating with other drivers is one of the things I least like about driving. It’s less of a stretch for me than for a driver or habitual taxi user to have to negotiate the scores of interpersonal transactions involved in using busy subway trains. a nice train instead, lucky people. 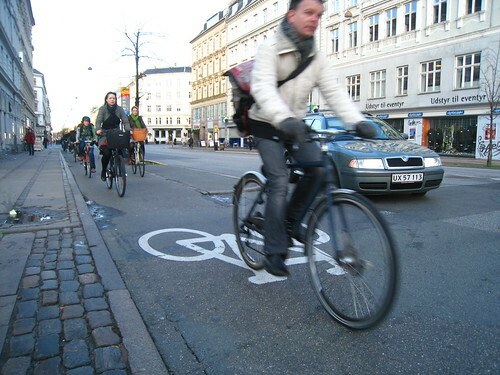 It’s certainly no coincidence that cities that are good for cycling also tend to have good public transport. Copenhagen has a magnificent driverless metro system as well as good suburban S-Trains. Amsterdam has a formidable tram and suburban rail network. In the US, Portland, Oregon, has both some of the highest cycling and some of the highest transit ridership figures. Washington, DC, also enjoys a combination of relatively good cycling conditions and good public transit (even if the Washington metro’s train frequency and reliability could do with improvement). The careful planning and forward thinking required to build a good public transit network also tend to produce the kind of civic-minded thinking that prompts cities to curb car traffic, police streets well and put in good cycling facilties. New York and London, the two cities where I’ve most recently lived, fall in slightly odd places on the cycling-public transport continuum. Both suffered years of underinvestment. The 1930s-vintage lines that I use most heavily in New York are some of the city’s newest; London's underground steadily deteriorated between the 1960s and 1990s. Both cities veered off for decades in the direction of encouraging motor car use – under Robert Moses’ leadership in New York, inspired by his example in London. Moses fought to ensure badly-needed new transit lines were never included in his vast road-building projects. 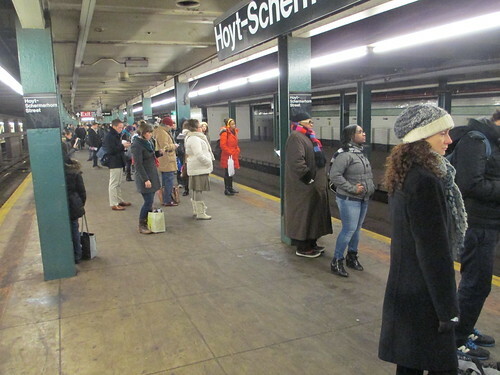 The spotty service I’ve experienced in recent weeks in New York is consequently an excellent summary of how the city is faring in both cycling and public transport. There are moments when the smoothness and progress from the worst times seems like a miracle. There are others when the main improvements from the city’s darkest days seem to be that the ageing trains are no longer covered with graffiti. The fire that kept me stuck underground isn't the only one I've encountered lately. The subway's challenges regularly remind me that I prefer to cycle when I can. I also enjoy the exercise, the fresh air, the views from the Manhattan Bridge and cycling's relative reliability. Cyclists also avoid some of the hassles that come in winter as the homeless and disturbed crowd onto subway trains for warmth. But, on days when the weather gives me no choice, the subway reminds me of the excitement I still feel at living in this mad experiment of a city, scattered on the islands and peninsulas around New York Harbour. words that still sound oddly exciting to me. Even the littlest detail of the journey can send that welling up in me. There’s the rattling of an express train through a local station, its lights flashing as they pass the support pillars. There are the names that evoke a thousand novels, songs and films. There’s the bizarre mixture of all kinds of cultures and classes one finds crammed onto many subway cars. All are summed up sometimes in the announcements that squawk out over the public address as I step onto the train. 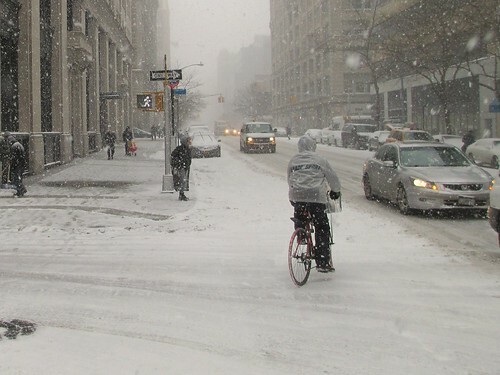 All of my interlocutors shared the view of probably the vast majority of New Yorkers about cycling in the depths of a harsh winter – that it’s not only impractical but a little bit wrong or insane even to try. The sentiment seems all the more dispiriting for being so often expressed with a kind of glee: “Ha! So that’s put a stop to your little cycling experiment, hasn’t it?” Riding to work is only a hobby, go the none-too-subtly expressed subtexts. It’s a lifestyle choice that I can and should reverse at the slightest provocation. However, the ferocity of the current New York winter – which has seen me cycle to work in temperatures of -13C (9F), with windchill making it feel like -23C (-9F) - has forced me to re-examine my view that I can cycle to work pretty much every day during winter. For a solid week recently, slush lay stubbornly on the roads, unmelted as temperatures remained below freezing, making any attempt at cycle commuting feel foolhardy. I’m consequently working on a new principle. I’m happy to fight the forces of nature, I’ve decided, but won’t defy the laws of physics. The challenge now is to work out which days fall into which categories. 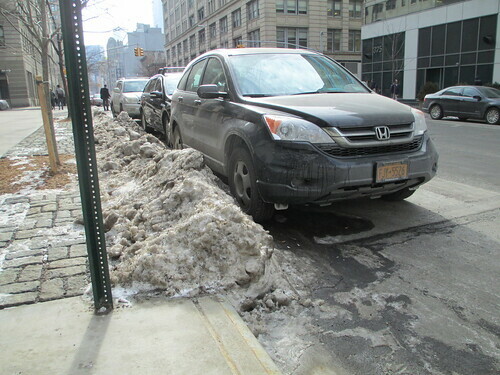 It’s not all bad, after all, trying to ride a bike in winter in New York City. Last winter, my first as a New York resident, I was delighted to discover some advantages of the city’s winters over the less cold ones through which I’d cycled in London. 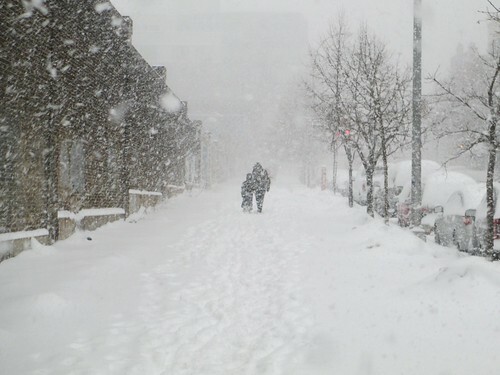 Because the temperature would stay below freezing for days at a time, snow cleared from the roads generally stayed cleared rather than melting, refreezing and turning into icy slush. Because the air was less damp, on snowless days temperatures could plunge far below freezing without producing the thin coating of black ice customary on London streets in such weather. Every night for a whole week last winter, I’d ride across the Brooklyn Bridge on the way home, glance at the big thermometer perched atop the Watchtower building by the bridge and see temperatures no higher than -8C (17F). I managed an 18-mile round trip in such temperatures by putting on more layers than normal, I told myself. What winter weather was likely to stop me? It’s a question to which I’ve had a few clear answers this winter. One morning, for example, I decided that the previous snow was now so well cleared that it was safe to try riding to work. Part way across the Brooklyn Bridge, I discovered the peril of judging conditions by roads already warmed by hundreds of cars. The snow on the bridge, I discovered, had half-melted then frozen again as water on each of the hundreds of wooden boards making up the bridge’s walkway. Even walking the remaining mile or so across the ice sheet to Manhattan was a desperately slow, laborious process. Another morning, relieved to be cycling to work after a few days thwarted by snow and ice-covered roads, I emerged from my apartment to discover freezing rain was falling. The sidewalk below my feet was already slick with ice. Back to the apartment went the bike. Shoulders down and gingerly to the subway station went I. The morning my neighbour told me I was crazy, I was actually returning, crestfallen, from the briefest of attempts at cycle commuting. 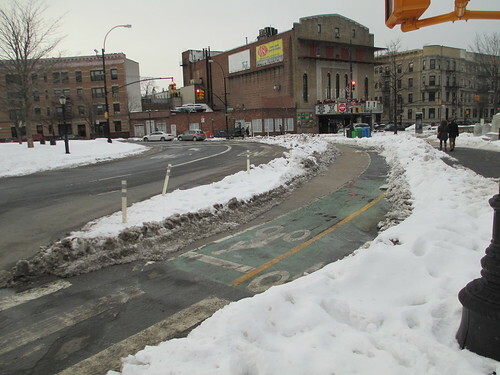 Finding that, three days after a big snowfall, residual snow on the road felt so slippery I was fearful of going any further, I was returning my bike to my apartment and heading, yet again, for the shelter of the F Train. At its worst, this run of weather has left me feeling something not far short of a crisis of identity. I feel like myself when I ride my bike to work and not when I don’t. “Ha, ha, ha!” say my nastiest inner demons. “You present yourself as a tough, bold fearless cyclist and you haven’t been on your bike in a week! You’re probably on the brink of ditching cycling forever and commuting all the time by subway!” The lack of my wonted exercise has certainly left me feeling fidgety and sluggish a lot of the time. I even had a day off sick last week – for the first time in at least two years. I am, I tell myself, just another unfit, middle-aged man resenting a commute in the kind of proximity to strangers that I’d normally consider with no-one but my wife. At lunchtime, I’ve looked mournfully at delivery cyclists, marvelling at their ability to handle their bikes on the snow and ice and cursed myself for not being prepared to do the same. I’m even cursing myself by comparison with my past self. Is this, I ask myself, the same man who rode home from work through a blizzard in London in January 2009? Or is it a mere pale imitation of him? Two full months of harsh winter gone by, however, and I am, perhaps, finally coming to some kind of radical acceptance. My caution, I keep telling myself, is largely warranted. Men of six foot five on touring bikes have, after all, a high centre of gravity and limited purchase on the road. It’s probably a risk not worth taking. My readiness to withstand the low temperatures is also, I tell myself, a bit beyond most other people’s. On that coldest morning, when it felt like -23 C, I not only found that my water bottle had frozen solid by the time I arrived but that my gears stopped working properly, as the grease I’d used to lubricate them started to freeze. Mornings such as that have counterbalanced the days I’ve felt a failure for slinking off to the subway. While they wouldn’t seem extraordinary to cyclists from cold-weather cycle-friendly countries such as Finland or Sweden, they give a temperate-climate cyclist such as me the illusion of having achieved something by riding to work. I was delighted in a recent Transportation Alternatives video to find some other cyclists feel the same. claimed to be offering "good service" on this line. As for the feeling that I might be tempted to switch permanently to the subway, I’m always surprised by how quickly it evaporates. Certainly, the subway itself has done its part in that direction. 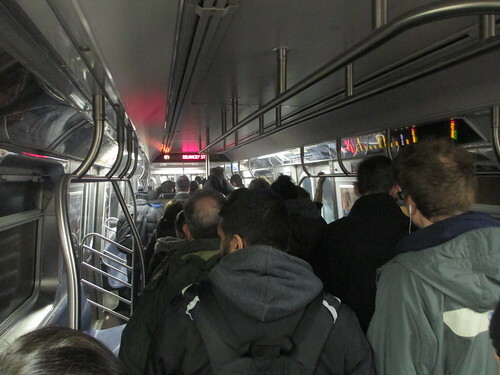 On Friday, minor problems on the A Train produced vast crowds at the station where I needed to change trains. On the worst of the recent snow-affected nights, I found myself trapped for 40 minutes on a train stopped on a viaduct 50 yards from my house but unable to get off. The entire journey home – at most 45 minutes by bike – took two hours. Yet being on my bike is a still bigger factor in changing my outlook. There remains a skill to riding in the cold even on the days when it’s not prohibitively dangerous. I’ll glide over this ice patch then swerve round the next one, I tell myself. I try to distinguish leftover snow from gritting salt. I devise strategies to get my gears moving again when they’re gumming up. Most of all, I enjoy how extreme cold brings out yet another face of the city. I see ice floes packed by the banks of the Hudson River and notice how professionally the city’s people wrap up for such weather. of this crisp, beautiful light. It may, I suppose, seem a little crazy to far more people than just my neighbour and my gloating colleagues. There are mornings when I certainly feel less stressed to be letting the subway worry about the weather conditions for me. But there are other mornings. They’re mornings where I negotiate the ice patches at the start of the Manhattan Bridge bike path, ride out over the river and am confronted with New York in one of her most beautiful moods. Thin whisps of steam spiral up from chimneys into a clear blue sky and the low sun shines the crispest, clearest light imaginable on the city, casting buildings half into bright sunlight and half into deep shadow. I ride over the crest of the bridge such mornings and down towards the star anise smell of Chinatown’s restaurants and tell myself: if this is crazy I barely really want to be sane.